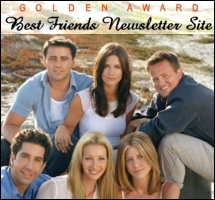 Friends Newsletters is a free monthly Newsletter filled with info on the show and the cast of Friends. The lives and careers of the cast- Jennifer Aniston, Courteney Cox, Lisa Kudrow, Matt LeBlanc, Matthew Perry, and David Schwimmer. With polls, trivia, quotes, stats, stories, spoilers and more. Plus all the recent news on the Joey show, new friends movies and appearances. RachelJoey@aol.com is the Vice President Settember@aol.com is the Pres. We send our newsletter through TOPICA. Enter your email to join Friends Newsletters today!